If your website follows a strict column layout with pre-defined dimensions, you can customize the area occupied by the Walls.io widget. To customise the embed code for that website, just enter width and height and you’re good to go. But keep in mind that manually setting the width and height only makes sense if you know exactly how large the widget should be when it’s displayed on your website. 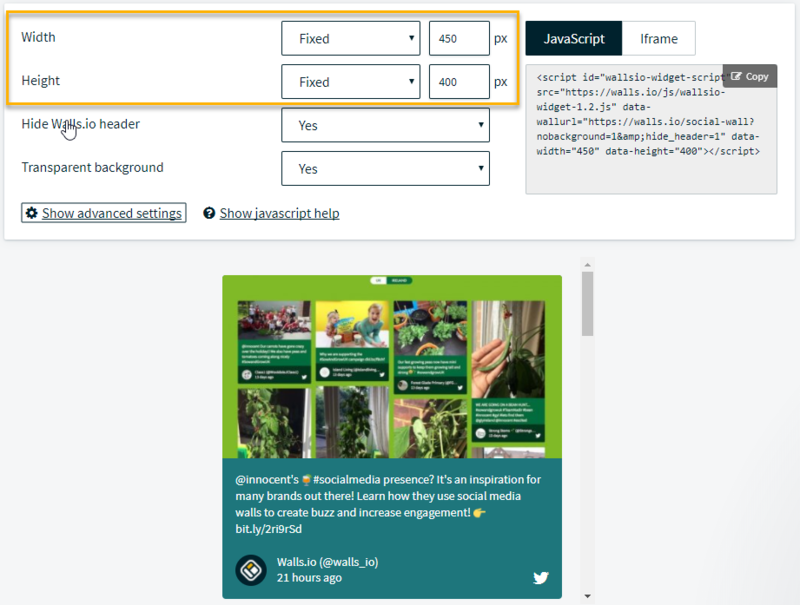 When you don’t have to adhere to strictly defined dimensions, you don’t have to bother setting a specific width and height for your social wall embed. Instead, you simply check the “Responsive” checkbox next to the width/height settings. 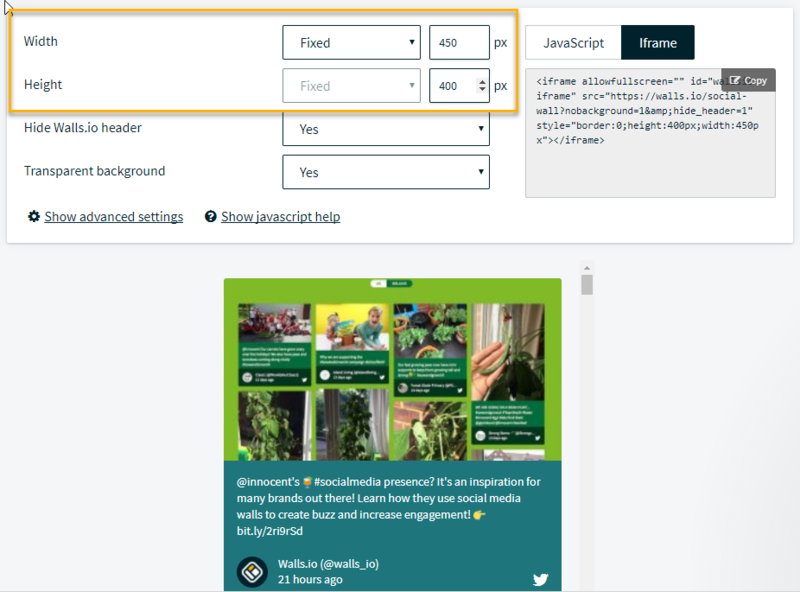 That switches the width attribute of the embed code from fixed pixels to 100% — this means that your social wall embed will automatically extend to the full width of the containing HTML element, for example, a sidebar. If you want to get rid of ugly scrollbars as well, make sure you have the "Height" setting on "Auto". With “Auto” height enabled, the Walls.io widget will automatically extend its height to fit all posts. No more scrollbars! In case you're technically inclined, feel free to customize the "Lazy loading threshold" setting. In the "Embed & Display", you’ll find the standard iframe code and a few settings to adjust the widget. By selecting "Fixed" width, you can manually set the width and height of your iframe embed. Any change here is automatically translated to the HTML code on the right. That switches the width attribute of the embed code from fixed pixels to 100% — this means the Walls.io Iframe will automatically extend to the full width of the containing HTML element, for example, a sidebar. 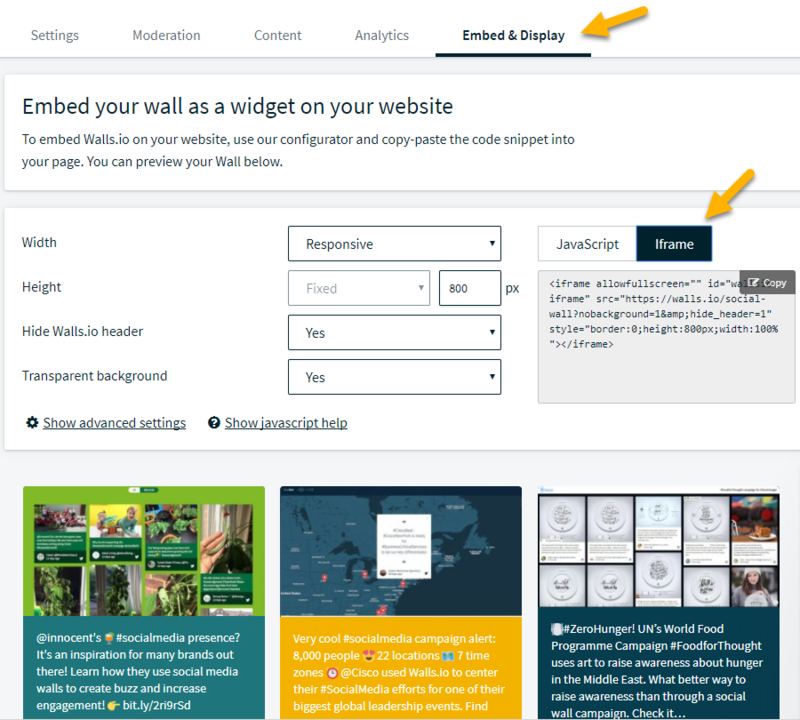 To help you embed your social wall to WordPress faster we built a Walls.io WordPress plugin. Learn more about it and download it here.